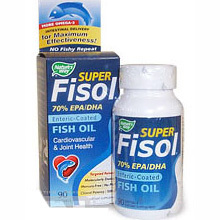 Super Fisol Fish Oil 70% EPA/DHA High Potency Enteric-Coated Premium Fish Oil Concentrate Cardiovascular & Joint Health Targeted Release Clinical Potency / 500 mg Delivers up to 3X better absorption than non-coated fish oil Intestinal Delivery for Maximum Effectiveness Super Fisol Mega Potency Omega-3 Super Fisol contains a pure, highly concentrated cold water fish oil with 70% omega-3 essential fatty acids: 40% EPA (eicosapentaenoic acid) 30% DHA(docosahexaenoic acid) Helps Reduce Risk of Heart Disease: Supportive but not conslusive research shows that consumption of EPA and DHA omega-3 fatty acids may reduce the risk of coronary heart disease. Additional Benefits: Research confirms the important role of omega-3 fatty acids in maintaining healthy blood triglyceride levels, as well as supporting the heart, skin and joints. This entry was posted on Tuesday, February 28th, 2006 at 10:59 am and is filed under Vitamins And Supplements. You can follow any responses to this entry through the RSS 2.0 feed. You can leave a response, or trackback from your own site.